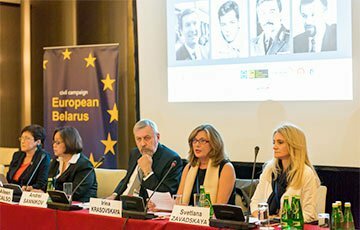 On September 24 2015 in an event dedicated to the enforced disappearances in Belarus took place in Warsaw, Poland. The event was organized by the European Belarus Foundation with the support of The German Marshall Fund of the United States, The Solidarity Fund of Poland, the Polish Helsinki Committee, the Belarusian Documentary Center, We Remember Foundation, the International Coalition Against Enforced Disappearances, the Asian Federation Against Involuntary Disappearances (AFAD) and The Belarusian House (Warsaw). The event took place during the OSCE Human Dimension Implementation Meeting. It was called Enforced disappearances: Stop impunity. The Speakers of the panel discussion included Irina Krasovskaya and Svetlana Zavadskaya (co-founders of We Remember Foundation), Mary Aileen D. Bacalso — (Secretary General of AFAD and Focal Person of ICAED). The discussion was moderated by Andrei Sannikov, coordinator of the European Belarus Civil Campaign. Almost every year we have resolutions of international political organizations criticising human rights violations in Belarus, - noted Irina Krasovskaya in her speech. - Unfortunately we can detect less and less attention to the cases of disappearances in the official documents. This topic somehow disappeared from the European’s list of demands for the normalization of relationships with Belarus. All the recent visitors from the EU did not find the time to meet with the families of disappeared or even respond to our letters (one of the latest examples if the visit of Latvian Foreign Minister to Minsk). But we do continuing our work, said Irina Krasovskaya. - During all these long sixteen years of seeking justice I understood one very important thing: only in solidarity are we strong. So today We Remember foundation is a member of Steering Committee of International Coalition against Enforced Disappearances. Nowadays we are involved in a wider struggle not only for our families or our country but for every person in the world and their right not to be disappeared. The discussion was followed by screening of the documentary «The Gang» about enforced disappearances in Belarus. Documentary was presented by the Film Producer Raisa Mikhailovskaya, Director of Belarusian Documentation Centre.